There are two types of franchises.Â Brand franchises and Business Model Franchises.Â Â I don’t really know anything between the two.Â With a brand franchise, you buy the use of the name, and that’s it.Â These are not very common anymore, but they used to be (Ace Hardware, Sherwin Williams Paint, etc. )Â Business Model Franchises are the ones that work today – started and perfected by people like Ray Krok.Â These are the ones where systems and operations manuals are painstakingly worked out through repetitive motion and the results are then used to build better copies of each franchise.Â These franchisees feed the “mother ship” and the mother ship makes better babies.Â The owners of these businesses concentrate on getting customers, not the systems of the business. 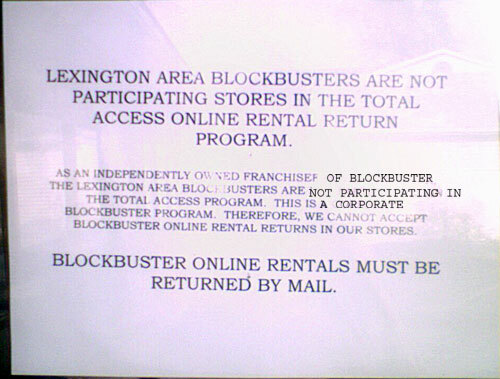 I ran into this today returning a movie to Blockbuster here in Lexington.Â Even though the ads for Blockbuster’s new On-Line Netflix competitor “Blockbuster Online” have been filling the airwaves (good franchise marketing at work) I found this posted on our neighborhood store.Â Earlier, the same franchise didn’t participate in their “keep as long as you like” program.Â Â So essentially any brand manager wanting to take advantage of the program designed to keep these brands relevant in today’s movie-at-home and download-to-watch era are being shunted.Â Okay, I don’t know the whole inside story, and it may be due to a problem that the Corporation has caused rather than the franchisee, but as a consumer, I see only the words “NO!”Â So the competitive advantage that Blockbuster had over Netflix (return and get a new movie) has been removed. Sorry for photo quality, my phone cam sux. In my opinion this is one of the reasons that franchises should build into their models compliance penalties (and bonuses.) If a franchise refuses to adopt a proven system-wide program, they are charged a non-compliance fee on their royalties.Â This would give the corporation the ability to control the brand and customer experience. Yeah, I know that most promotions say “at participating ____” but isn’t the whole point of franchises to, er, participate? Franchises aren’t designed for the independent-minded. They depend on a by-the-book execution of a business plan, adherence to time-tested systems and a willingness to follow directions.